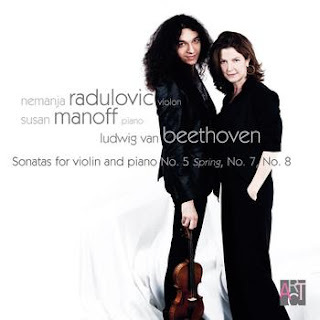 Lyricism and simple elegance are the order of the day in this recording of Beethoven sonatas from Nermanja Radulovic and Susan Manoff. The tone they adopt for most of the movements is one of lightness and grace, making the whole experience very pleasant from beginning to end. The two players really are equal partners in every respect here. The piano is recorded at about the same level, and sometimes even above, the violin. This means that the duet textures between the piano right hand and the violin work very well indeed. It does mean that Radulovic sometimes has to struggle to maintain the foreground in the some of the louder passages, but that's a small price to pay. The recordings were made live, and the concert hall atmosphere is a real asset. The acoustic is warm yet precise, and it really benefits the piano, although the violin has less of an aura. Radulovic plays with a lively tone, his vibrato is modest and judiciously applied. I find his timbre at the top a little shrill, especially in the louder passages, although Beethoven rarely goes up there anyway. There are one or two slightly shaky intonation moments, consequences no doubt of the live recording, but most are fairly minor. The only real howler is the penultimate note of the 8th Sonata, which in the excitement of the moment ends up wide of the mark. However, judging by the rapturous applause that follows, the audience on the night were more than willing to forgive that single slip. More of a concern for me is the lack of weight in some of these movements. Radulovic and Manoff have the ideal approach when it comes to the Spring Sonata, nothing there is ever laboured or unduly ponderous. But when they get to the 8th Sonata (Op.30 no.3), the music, especially of the first movement, cries out for more muscular treatment. There are only a few passages where real heft is appropriate, but it is necessary to balance the lighter textures elsewhere. Without it the whole work seems less consequential than it could be. So, an approach then, that seems more suited to the early sonatas than the late. It is probably just as well that the Kreutzer is not included here, but there would certainly be scope for these players to approach the earlier sonatas in this elegant, attractive style. And I wonder if they have played the Mozart sonatas together? Surely they must have. I could imagine this duo really coming into their own with him.